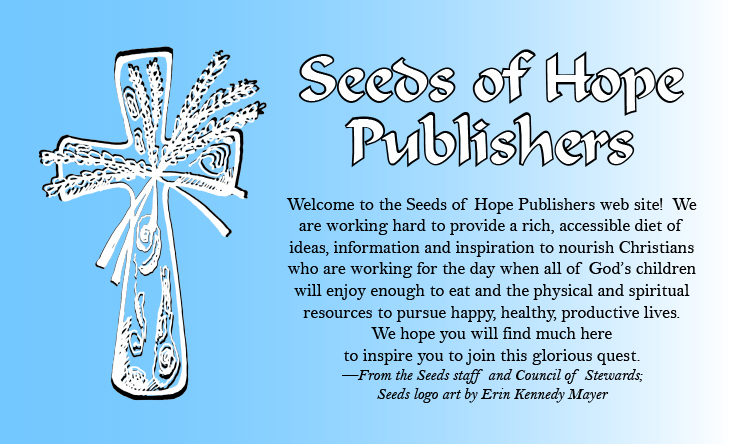 Seeds of Hope is a private, independent group of believers responding to a common burden for the poor and hungry of God’s world, and acting on the strong belief that biblical mandates to feed the poor were not intended to be optional. The group seeks out people of faith who feel called to care for poor and hungry people; and to affirm, enable and empower a variety of responses to the problems of poverty. Hunger News & Hope: On-line access to the award-winning newsletter Hunger News & Hope, dedicated to informing readers of the realities connected with food insecurity and enabling them to find ways to respond to God's people in need. Worship Resources: The Seeds worship packet series, Sacred Seasons, includes sermons, children's activities, litanies, prayers and other resources designed to help you and your congregation stay centered in God's love for the poor and the poor in spirit. You'll also find special resources, like our Easter Walk for children, a series of resurrection monologues, two collections of sermons about hunger, and much more. Educational Resources: Seeds has produced a number of education resources, like the Hunger in God's World workshop curriculum, Developing a Heart for the Hungry: A Hunger Emphasis Primer for Beginning Churches, and more. You will also find informative statistics, thought-provoking essays, and basic learning activities to help start meaningful conversations about poverty and hunger. Special Sections: Under the tab "Where Are People Hungry?" you can look up various countries that are experiencing hunger, as well as an overview of progress and frustrations of the past several decades. Under "Why Are People Hungry?" you can read about the causes of hunger in the world. Under "Hunger Bytes," you can read musings and blogs from some of our writers.